No beach required! Tousle and texturize your hair for all day De-Constructed style that looks done-yet-undone. Get touchable control with a subtle, satin finish. Beach Chic creates loose, textured waves for naturally bodified looks that are non-tacky, not stiff or weighed down. 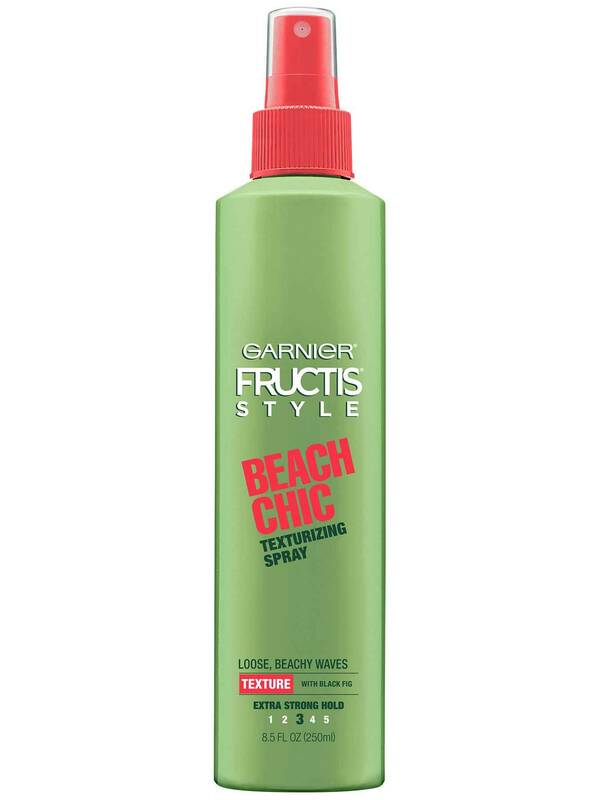 Garnier Fructis Style Beach Chic Texturizing Spray, with black fig, is a unique sheer-texturizing styler with sea salt that gives definition and lasting control. Free of drying alcohols, this formula doesn't clump hair or leave it too slick or too shiny. Shake well. Spray evenly on damp or dry hair. Twist and scrunch hair as you air-dry or blow-dry with a diffuser. For extra wave, twist and let it stay overnight. Rated 5 out of 5 by MamaBear277 from AH-MA-ZING I discovered this product by accident and I am SO glad I did!! I never knew my hair had so much beautiful curl in it!! This product is so light and smells fantastic! Even when I am stuck in my cube at work, I am happy that my hair can have a beach day! Rated 5 out of 5 by rocioespindola from Beautiful beachy waves! Loving this product! My hair is extremely straight , so it’s pretty hard to get any time of volume and curls. My routine at night after showering I blow dry and braid my hair, I wake up with these beautiful curls! I spray some water and this product and WAHLAAH!! My curls stay all day! And it does not leave your hair stiff like other products. Definitely recommend it! Rated 4 out of 5 by HeavenlyErra from Great curls! This product is perfect for my curls and it reduce and frizz that my hair may produce! The smell is also amazing and it lasts throughout the entire day! Rated 4 out of 5 by LCap510 from Curly Curly! I received this item and couldn't wait to try it, I've been doing (or trying to do) beach curls with tons of different methods and products. This spray definitely works, better than most. I have wavy hair, not curly, but this gives me the curly beachy look I really love. I would give 4.5 stars if that was an option. I can spray my hair while wet, but I get better results when I spray it while dry, and it has a nice smell. I don't love the feeling of the product on my hair, but I'm not a fan of hair spray or other things like that, but it's not awful and I will absolutely continue to use this product. Rated 5 out of 5 by Mandyrdz23 from Garnier Fructis Style-Beach Chic First of all, I love the smell! The nozzle gives the perfect amount of coverage, it does not just spray directly to the spot but it sprays evenly. It is not heavy nor does it get white when it dries. The liquid is not heavy at all but it does provide that extra strong hold. The best part is it is not sticky and it keeps my curls in tact and it does not make them weigh down. Rated 4 out of 5 by DisneyLuvinMom from Worth A Try!!! 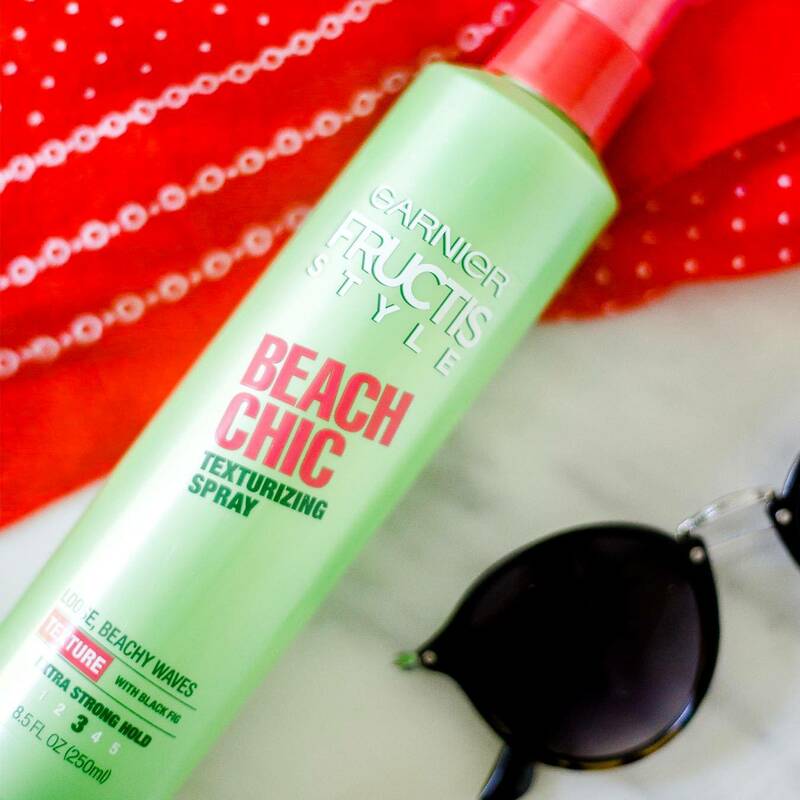 I was really excited to try Garnier Fructis Style Beach Chic Texturizing Spray for a different hairstyle option. My hair is a little longer than chin length and is fairly course but I don't really have straight, wavy, or curly hair, so I usually end up flat ironing it every.single.day. I first tried the texturizing spray on just washed, air dried hair but all I seemed to get was a frizzy mess. So I tried again by spraying it liberally on just washed, wet hair then scrunched it with my hands and then let it dry. That made a huge difference! I ended up with a nice beach wave look that gives me an alternative to having to flat iron my hair all the time. I can't wait to use this spray after swimming. After getting out of the pool I never know what to do with my hair since it's too short to pull up, and at the same time if I just let it air dry with no products in it then it turns in to a bunch of frizz. I think this product will be especially great to use this summer!! Rated 5 out of 5 by Keepingupwithcarina from The search is over ! Garnier beach chic has ended my search for a hair product that enhances my natural wavy! I have tried a countless amount of product that have failed to give me the texture I was looking for until now! Garnier beach chic took my dull, messy "wavy" hair and gave it shine and actually made my hair look amazing ! It smells great also ! I found that spraying the product then twisting hair in a bun or braiding worked best to get the waves I was only able to get duiring a summer time beach trip ! 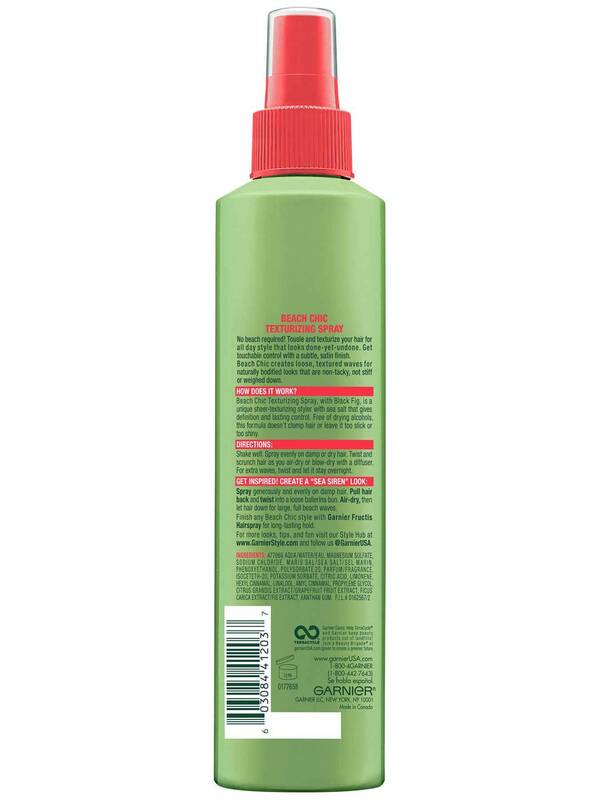 Rated 1 out of 5 by hgill1987 from Beach Chic Texturizing Spray I was excited when I received Garnier Fructis Style Beach Chic Texturizing Spray and attempted to use it right away. Following the directions to a 't', I applied the product to my damp hair and scrunched it like the directions told me to. Unfortunately, the spray had no effect on my hair. I will admit that my hair is fine and it does not hold curl well without thousands of layers of hairspray, however, my hair does curl before I use the hairspray and this product had no effect. I even put the product in my hair, tied it into loose buns, and went to sleep for the night. As soon as I took my hair down, I was disappointed to find that my hair was straight as ever. I would not recommend this product to anyone as it did nothing for my hair.